The Supreme Court’s new talent agent. 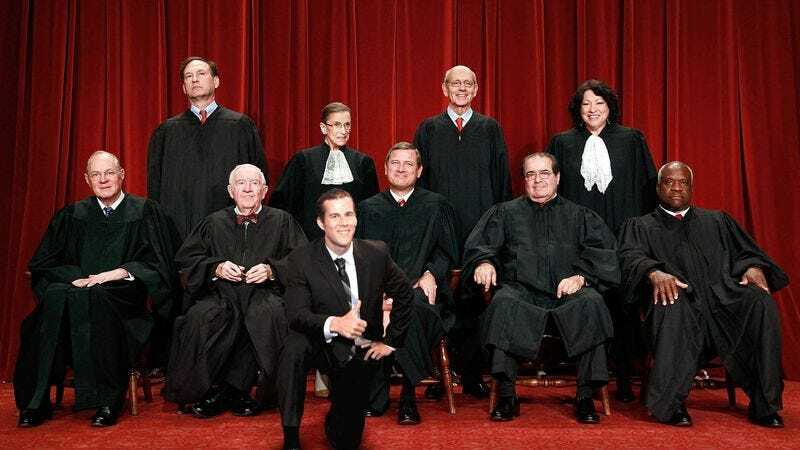 WASHINGTON—The justices of the United States Supreme Court confirmed this week that although he has been on the job less than a year, their new agent, Rory McCleft, has already started to help the nine-member panel land more high-profile cases. Early in its 2011–2012 term, the nation’s highest court reportedly began to voice dissatisfaction with longtime agent Jeffrey Muslin, who many justices felt had lost sight of their jurisprudential interests, in particular failing to get them access to “cream of the crop” immigration, health care, intellectual property, and search-and-seizure cases. According to legal experts, McCleft, a senior partner at Taggart, Stanley & McCleft Representatives and a rising star in judicial talent management, has in a few short years in the business built up an impressive client roster that includes numerous federal district courts, state appellate courts, and even a handful of military tribunals. Sources said the Supreme Court justices often became frustrated with their former agent when he seemed to place greater priority on his other top client, the New Jersey Superior Court. Their rancor came to a head when Muslin booked Englewood Boat Basin et al. vs. Quartello and Quartello for the New Jersey judges. The Supreme Court has had its share of notable agents over the years, including the legendary Saul Rosen, whose savvy negotiations were credited with making the Warren Court the most powerful in Beltway history, and the notorious Frank Tanner, whose backroom dealings allowed the Rehnquist Court to become the first ever to decide an American presidential election. Given the court’s infamously rigorous demands, McCleft is expected to have his work cut out for him. Although McCleft’s compensation remains undisclosed, it is assumed he will be given the industry standard rate of 10 percent of all court cases to decide for himself.